Sometimes it takes that one extra listen. See, I was about ready to categorize 'Aya Sawan Jhoom Ke' as another of those one-good-song-and-not much-else-on-it soundtracks that I arguably own too many of, when I suddenly found myself rather liking it more. Take the title track... traditional sounding, very percussive, didn't really fancy the melody much at first but then it slowly snuck itself into my head – it's actually quite catchy – at which point I started to notice a bunch of cool instrumental details as well. So yeah, it's good. As are Mohd. Rafi's equally drummy (but slower) 'Yeh Shama To Jali' and 'Bura Mat Suno'; they're growing on me too. And so is his 'Majhi Chal'; pastorally sweet and romantic and driven by a compelling soft groove. 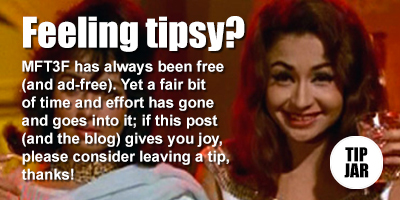 My favourite is still that initial one song though, Asha Bhosle's superb cabaret number 'Main Ek Haseena'. 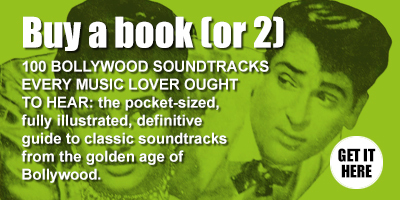 Happy, boisterous, featuring horns, great guitar bits and a killer beat, spiritedly performed on screen by Laxmi Chhaya, the next best thing to Helen. The soundtrack would have been worthwhile just for that.